Dr. Max Stern, E.J. Hughes's art dealer in Montreal, had urged him to travel across Canada to paint city scenes, and in the fall of 1956, Hughes set off on this mission. He produced images of Calgary, Regina, Toronto, Montreal and Ottawa in detailed drawings, watercolours and oils, such as this fine depiction of Regina's parliament building. 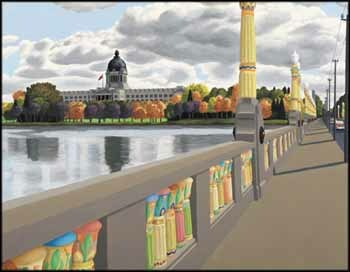 Hughes's choice of this long view down the Albert Memorial Bridge over Wascana Lake, created with meticulous sightlines, is striking. Reflecting the great interest in the discovery of the stunning treasures in King Tutankhamun's tomb in 1923, the terra cotta balusters on the bridge were designed with motifs of lotus flower and papyrus and painted with bright pastels. Hughes offset the classic Beaux Arts architecture of the parliament building and the Eygptian-influenced bridge against the lake and park-like surroundings, creating intriguing architectural contrasts while observing the tranquil balance between the man-made and the natural. On his return to Vancouver Island, after completing his studio oils derived from this trip, Hughes resumed his depictions of rural British Columbia, making urban scenes such as this, particularly in oil, rare to the market.